The Indus Hospital is continually pushing its geographic boundaries of service delivery disease prevention in an effort to provide patients with comprehensive healthcare absolutely free all across Pakistan. Hence, it has now evolved into a network of hospitals spread all across Pakistan, some of them are owned and managed by Indus Hospitals and some of the hospitals’ management has been handed over to Indus Health Network (IHN) through a public-private partnership agreement with the provincial governments. 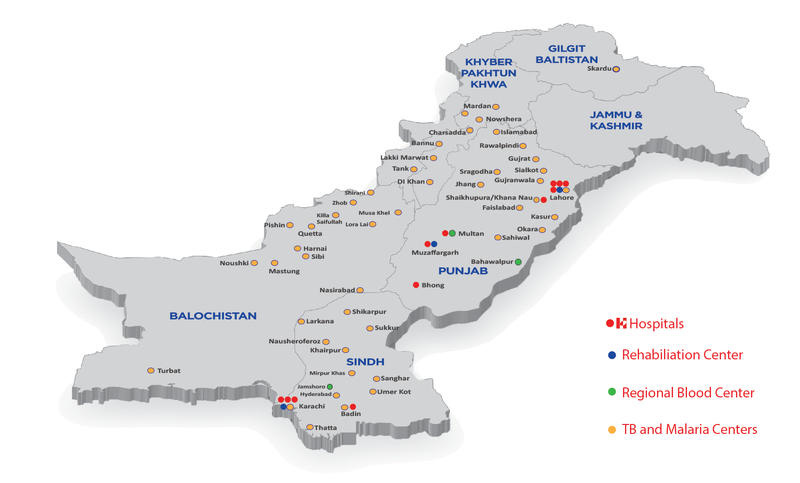 Establishment of hospitals across Pakistan outlined the need for early detection and prevention as important components of holistic healthcare provision. To address this need IHN has initiated a number of public health outreach programs across 41 districts of the country. The Indus Health Network has set up regional blood centers under the public private partnership agreement in order to facilitate blood transfusions and blood management at Government owned facilities. The Physical Rehabilitation centers are also housed in many of the IHN managed and owned hospitals across Pakistan. Please hover over the on the map to view the names and details of each hospital.